Let's assume for a moment you are a film maker who makes rational, competent decisions, and thus realized how stupid CGIing him in was and decided to recast Tarkin. Since you have an unlimited budget just like the Rogue One creators actually had, who do you hire? Lets be honest, Tywin and Tarkin are essentially the same dude. Were i in that position I would have avoided the character and explained his absence as gracefully as possible. If I had to I would prefer someone unknown rather than type casting someone from their other well known roles, which I feel is a failing of most fan fantasy castings. An alternative approach: have Tarkin on-screen only in holographic form. Star Wars holograms are notoriously low quality compared to the technology we see on display, and a digitally recreated Tarkin in holographic form probably wouldn't stand out too badly. But if I were to cast someone? Bill Nighy, maybe. Honestly, I liked Tarkin as he appeared in Rogue One. I thought the guy had the voice down pat and the CGI effect was (to me) not noticeable - certainly not as bad as it was for Leia. Perhaps that's because I never saw it in 3D, but oh well. Having seen it in 3D, the CGI was fine on its own. When in a scene with other live actors it was rather jarring, though. Leia looked fine but she wasn't on screen for long enough to really judge. This is what I was thinking as well. The digital character simply doesn't *quite* blend in. It's very close-- very good indeed-- but there's still a bit of uncanny valley going on. Honestly with characters whose actors have passed, it's a bit of a crapshoot. Either you simply accept that the character is recast and the appearance doesn't matter, it's still the same character; you use makeup; you get rid of the character; or, now, you digital them in. The easiest thing to do is killing them off, but that's not an option if they're part of your plot. It's kinda hard to avoid Tarkin in a movie about the first Death Star. 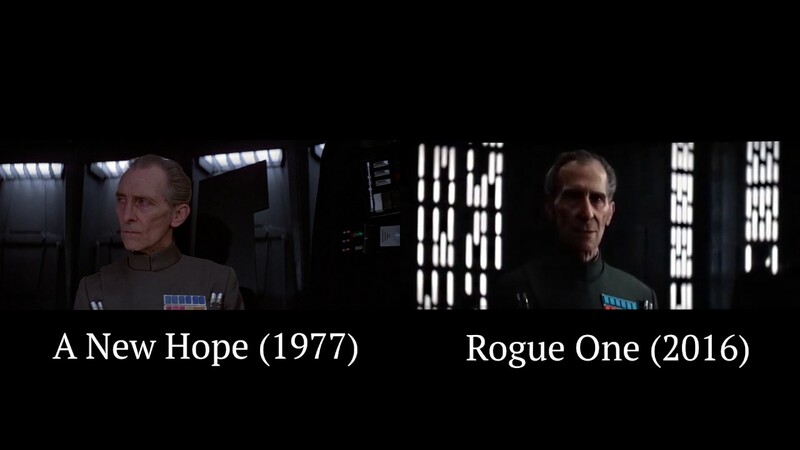 Rogue One on the other hand: there was a notable difference in sharpness and colour quality when they used a CGI face recreation on top of a live actor (Guy Henry. Whoever that is.). Compare the rank badge and the colour of the uniform. The shadowing on Tarkin is much more stark in R1, and the skin is shinier as well. An actual actor's skin would probably have been matted down with some makeup to prevent reflections. I can see the difference, but could that not be an artifact of using cameras that are 40 years newer? Quite possible, but IIRC they were deliberately attempting to technically emulate the 1970s era look to some extent in Rogue One, necessitated partly by their use of original film of X-wing pilots. But yes, a lot of the issues here can be ascribed to 'technology marches on'. Not a whole lot that can be done about that unless you wanted to go full arthouse and hunt up a bunch of old-school cameras and whatnot. 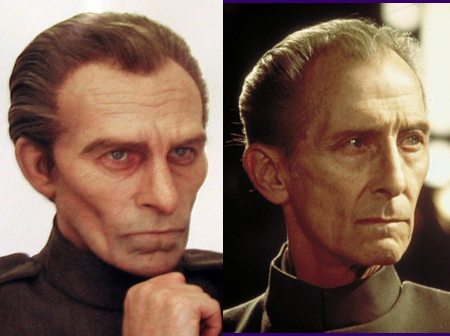 Hm, I think part of what makes Tarkin is his sunken-cheeked, ascetic/frail/severe look. With suitable makeup I suspect Dance could bring it off, but it's important enough to at least influence casting choices. I think here's a case where pushing the boundaries are justifiable. They got 99.9% there with their CGI Tarkin. Really if I hadn't known it was CGI I might have likely missed it - you do notice that *something* is off, but had you not been clued into it being CGI or did slow re-watches in HD I think many people would have passed over it completely. I saw it in 3D too, and I look at a lot of CGI and a lot of ANH. A tour de force for modern technology. It was approximately a billion% better than the guy with prosthetics at the end of ROTS, who was 100% a live actor and looked far faker even in the background. Here they had the budget and rationale to push the uncanny valley envelope. I think they very nearly completely pulled it off. To get all the way you'll need some test cases to see what can be done. That said, CGI Leia was awful. I watched it on Netflix and didn't notice that it was CGI, although my computer is low quality. I thought they did just fine. The shiny skin might just be the result of sweat, if there was a real person there. I suppose if anybody knows about this stuff it's Fractal. Body motion is incredibly easy compared to faces, and can be motion captured easily. There's a lot more anatomy going on in faces and our brains are hard-wired to track subtle facial cues, so everything has to be spot on or you get a stiff or otherwise uncanny valley result. I do agree there was something about the skin that looked a little off - hard to put my finger on exactly what though. And the small expressions were maybe a little twitchier than natural. But the subtlety with which they tackled the small bits of the face I thought was really exceptional. One of the problems with falling into the Uncanny Valley is that you're grinding your nose against a cliff all the time you're trying to get back out the other side. It doesn't take much to poke the average person's "that's funny" reflex with an only-nearly-right effort, even if they couldn't say exactly what's wrong. The Japanese research into virtual pop divas and newsreaders is IMHO similarly almost but not quite there yet. Maybe it's just that we're so familiar with the real people — CGI!Tarkin struck me more like someone else made up to almost look like the character, while CGI!Leia was significantly further away and deeper into the Valley. FWIW, I do 3D graphics as a hobby, it's got a lot better over the 15 or so years I've been involved, but it's only in the last year or so I could honestly say I was getting close to "good enough" in rendering a human figure. I think the issue with Leia might be a case of "it's too perfect". With Tarkin you had wrinkles and other signs of aging to hide the fact that skin lacked the natural imperfections, while Leia's smooth skin simply couldn't give us that. Though I'll admit it could also a matter of time as Leia is seen only at 1 scene, while Tarkin is seen thru out the movie, so the producers could have been forced to use most of their resources on making Tarkin look good. The same guy who did it in Rogue One, only without the CGI. Guy Henry is an accomplished actor in his own right (you may remember him as Cassius from HBO's Rome) who had experience with emulating Peter Cushing's performance (he played Young Sherlock Holmes, modeled on Cushing's take on the character) and looks similar to him. They knew what they were doing when they got him for the part. Errr - Guy Henry is a far more well known (and talented) actor than Wayne Pygram, dude. I dunno, Guy Henry just isn't that much of a household name. Pygram at least I knew from Farscape. That said, if you used Henry without the CGI you would still need makeup if you want him to look anything like ANH Tarkin, considering that Rogue One only happens a few days (at most) before ANH. Yeah, true. At the same time, after putting up with it for years in multiple seasons of GOT, I've suddenly become ok with recasts who aren't dopplegangers of the original actor. 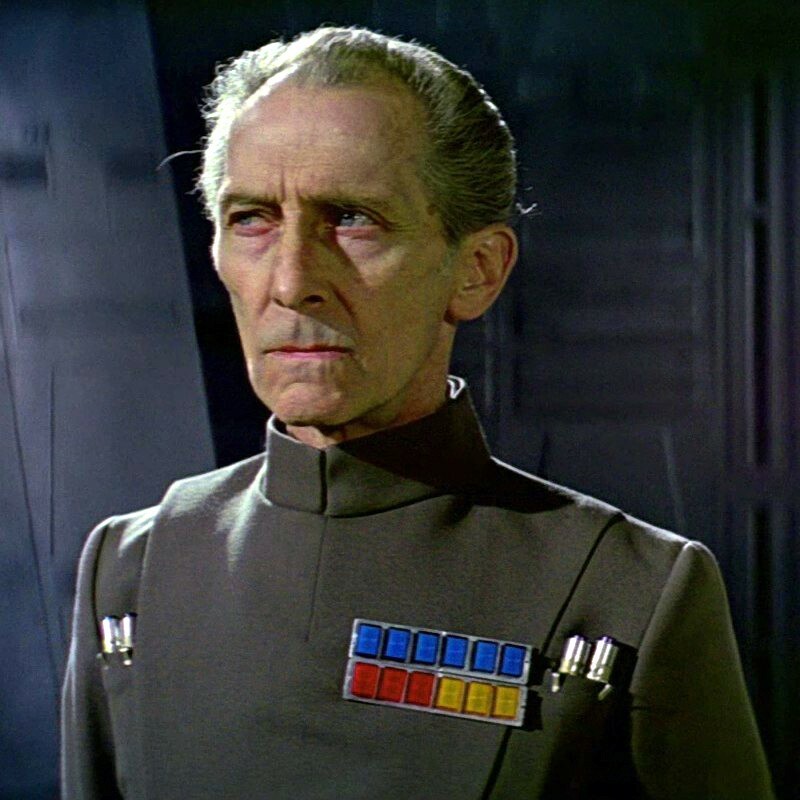 I don't think anyone else should have been cast as Tarkin. I'm perfectly happy with the result and it's only in the very first shot with CG Tarkin that there's a bit of strange movement, but it looks great in the rest of the film. I think CG Leia looked much, much worse (but it was such a brief scene).